Lucid Cotton Terry Mattress Protector Review was recently completed by the MattressJunkie.com team. Mattress protection is something to take very serious if you want to stay healthy and clean. Dust mites, allergens, body fluid, dead skin, are just a few things you have to worry about when it comes to mattress hygiene. We have reviewed many of Lucid’s sleep products and have found them all to be high quality and extremely affordable. Check out what we thought about the Lucid Cotton Terry Mattress Protector. Mattress protectors should be on every mattress in your home if you want to keep a healthy and clean mattress surface. The average sleeper sweats 26 gallons into their bed sheets every year. If you don’t have a mattress protector, that fluid along with dead skin and an array of other disgusting things sink directly into your mattress. A high quality mattress protector will keep you sleeping cleaner and preserve your mattress from bacteria year after year. How will the Lucid Cotton Terry Mattress Protector help me? The Lucid Cotton Terry Mattress Protector is 100% waterproof. This will keep liquids from soaking up like a sponge in your mattress. Lucid Cotton Terry Mattress Protector also stops dust mites from penetrating into the mattress while also blocking allergens. Allergy sufferers should look at their mattresses if they are curious where their allergies are coming from. Is the Lucid Cotton Terry Mattress Protector Zippered? The Lucid Cotton Terry Mattress Protector fits like a fitted sheet so you get top of mattress protection with a 100% waterproof barrier that guards against fluids and spills. What size mattress does the Lucid Cotton Terry Mattress Protector fit? 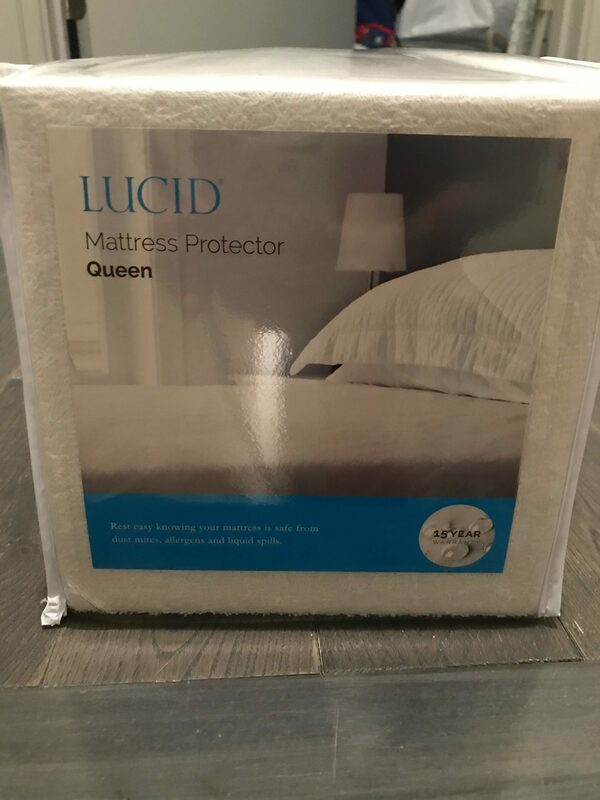 Lucid has the Lucid Cotton Terry Mattress Protector in twin, twin XL, full, full XL, Queen, King, and Cali King sizes and it will fit mattresses up to 22 inches in height. Does the Lucid Cotton Terry Mattress Protector come with a warranty? Lucid offers a 15 year warranty on their Lucid Cotton Terry Mattress Protector. How much does the Lucid Cotton Terry Mattress Protector cost? Final thoughts on the Lucid Cotton Terry Mattress Protector. Lucid produced a high quality protector at an affordable price. Mattress protectors from the furniture store will cost you $200. Don’t be sucked in to something way more expensive and not near as high quality. 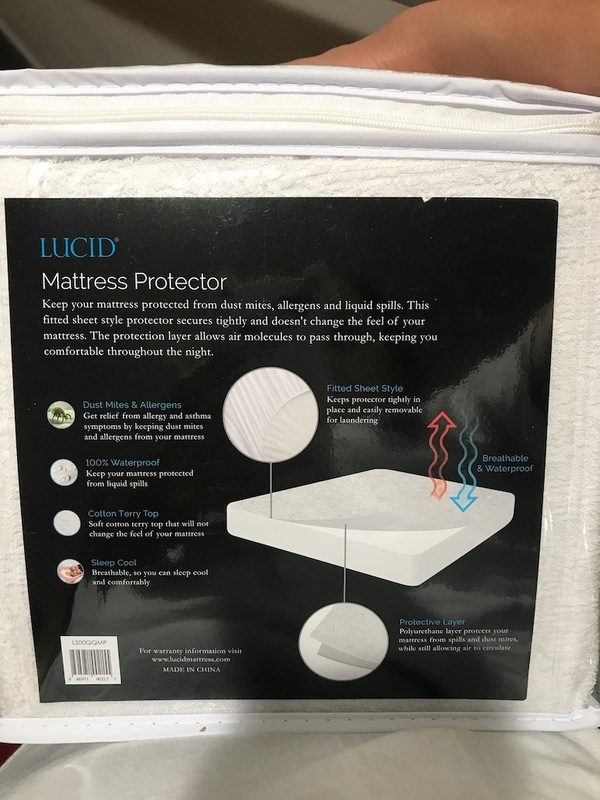 If you need mattress protectors, then Lucid would be a great option. Learn more about Lucid Cotton Terry Mattress Protector here….